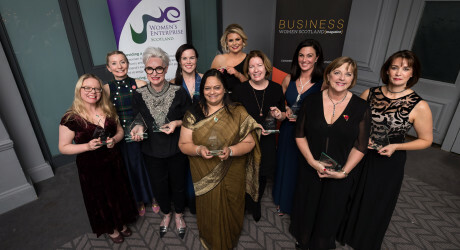 BUSINESSES from all across the country have been recognised at the Business Women Scotland (BWS) and Women’s Enterprise Scotland (WES) 2018 Business Awards (full winners’ list below). Established and emerging female business owners and operators from Wishaw, Bothwell, Glasgow, Moray, Greenock, Fife, Crieff, Stirling, Aberdeen, Newtongrange, Dundee, Forfar and Dunbar were presented with their awards at a glittering ceremony which took place in Glasgow’s Grand Central Hotel on Friday 2 November 2018. Double winners on the night included Jo-Anne Chidley, of Wishaw’s Beauty Kitchen, who won Growth Business of the Year and International Growth Business of the Year, and Celia Hodsonl, of Dunbar-based Hey Girls, who scooped both the Social Impact of the Year and Start Up Business of the Year Awards. Jo-Anne’s business, Beauty Kitchen, seeks to help change the face of beauty for the better. Their mission is to create the most natural, effective and sustainable products in the world and currently they have 120 products, distributed in over 1,400 stores, eight countries and 15 mini-Beauty Kitchens. Beauty Kitchen is acknowledged to be also the first retail beauty company in the UK to be B Corporation certified and will soon be Cradle to Cradle certified too. The judges all agreed Jo-Anne’s is a very driven company that has shown impressive growth both domestically and in non-UK markets, describing the results as “phenomenal”. Prior to setting up her business in 2014, Jo-Anne studied chemistry at University of Strathclyde before moving into a career in HR where she held senior posts at Avon Cosmetics Microsoft and Nestle. Celia’s business, Hey Girls, was founded on the belief that access to sanitary products is a right, not a privilege, and that girls and women should be able to live their lives without fear of stigma or shame. The business is recognised as the UK’s first and only Buy One Give One menstrual product social enterprise company and for every pack of Hey Girls sanitary products sold, the business give a pack away to someone in need in the UK via schools, colleges, foodbanks, women’s shelters and community centres. Hey Girls also provide educational resources to UK girl’s and women’s support organisations. The judges all loved this business idea and what it stands for, citing it as “very timely and well thought out enterprise with a very dynamic team behind it”, and also expressing their admiration for the disruptive business model , noting that Hey Girls were “doing something different that married business with social awareness”. Now in their second year of collaboration, the BWS/WES Awards are hosted jointly by two of Scotland’s leading female business organisations, each dedicated to helping women find support and networking opportunities to allow them to strengthen their business. With the awards, BWS and WES collaborate to celebrate the ongoing achievements of Scottish women in business. This year’s awards, supported by ScotlandCanDo, and sponsored by Scottish Enterprise, HIE, Business Gateway, Dentons, FSB and Royal Bank of Scotland, received a 200 per cent year-on-year increase in entries giving the judging panel the difficult task of choosing winners in each of the 14 hotly-contested categories.